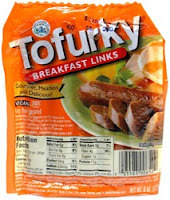 This week, it's a new breakfast sausage: Tofurky Breakfast links. I cooked these up in a skillet with a little oil to crisp them up on the outside, like a proper breakfast sausage, and served them up with some leftover strawberry pancakes. Exciting, yes? Well, not exactly. The sausages had an okay texture. Not mushy or overly chewy - just the right amount of chew. But the flavor was a big disappointment for me. I'm used to a little spiciness, maybe, and some nice herby flavors, like sage. This tasted, to me, like someone dumped a large amount of black pepper into the mix and called it a day. The ingredients include things other than pepper, but I couldn't taste anything else. I tried a bite of sausage with a bite of pancake, but the peppery sausage flavor drowned out the delicious strawberry slices in the pancakes! This simply wouldn't do, so I ditched the sausage. Sorry, Tofurky, this one is just not a winner. In fact, every Tofurky sausage variety I have tried has come out simply mediocre. Maybe this just isn't your thing? Flavor - nothing but peppery flavor - where are my other spices? Funny, i think all tofurky sausages all taste the same; with that kind of gluteny bland flavor. hmm these look scary! i've seen them a few times at the store and always wondered :) thanks for the review! I actually prefer Field Roast for anything resembling sausage, though their hotdogs have that same bland consistency you get with all fake meat. I liked them but why on earth would you want to eat them with strawberry - weird! I had home made jalapeno relish on mine, they have great texture and would work well in recipes.